You booked your appointment weeks in advance. The excitement was almost unbearable. How could you sleep when you knew your life would change in less than a month? Then the day came. You took a train, then a rickety cart, and finally, you walked the rest of the way up a winding path in the fog until you came to an old wood door that opened by itself. Drac wasn't in a high-backed chair in front of the fireplace like you envisioned. In fact, the interior of the castle was a lot different than you had imagined. It was bright white, well lit, and smelled like freshly roasted coffee beans. You could tell they had been doing some serious re-branding. The secretary at the front desk looked up from filing her fangs and smiled, "The master of horror will see you now!". These retro, oversized masks are an instant hit! Adding a splash of color and curiosity to any Halloween decor, this Vacuformed Drac hangs on any wall at just under two feet. 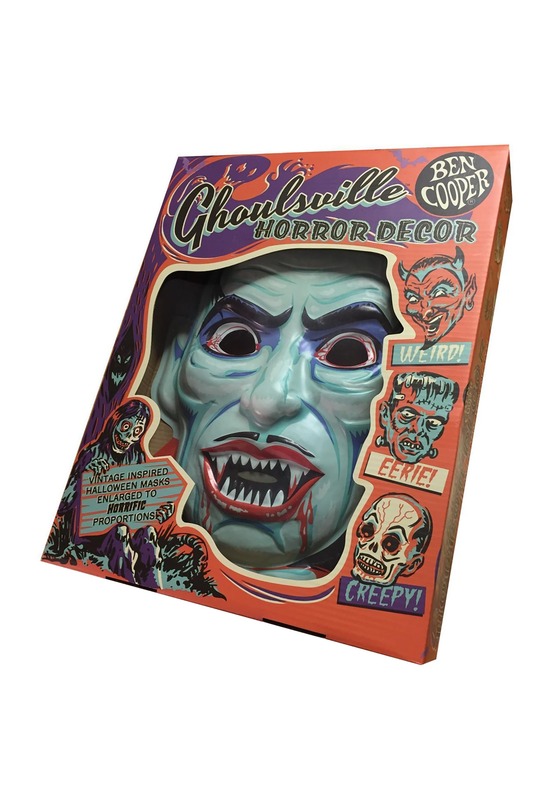 Pair it with the other Ben Cooper designed masks in our Halloween decoration collections and you'll have a unique retro look that no one will forget!